Czechs and Slovaks celebrated together in the presence of the LEN President Paolo Barelli on 19 January in Prague to mark the 100th anniversary of their once common federation. 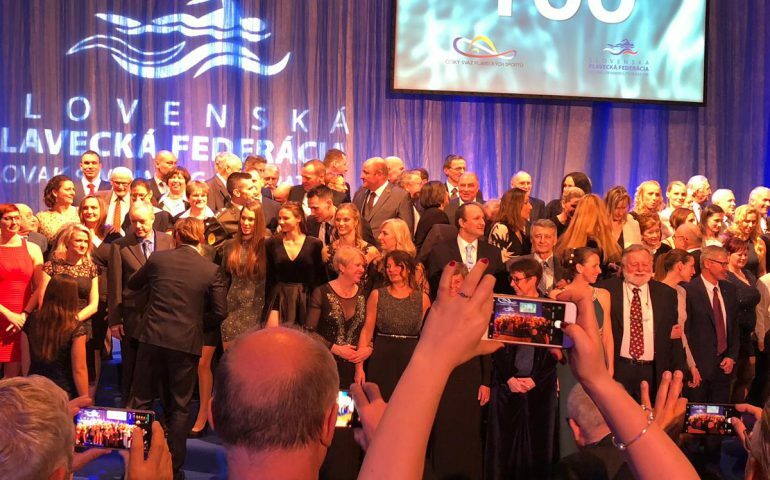 Though the country was separated to Czech Republic and Slovakia in 1993, representatives of the two aquatic communities joined once more for the centennial of the Czechoslovakian Swimming Federation founded in 1919. To commemorate the date, the festivities started at 19:19 on Saturday (19th January). In his greeting speech on site, Paolo Barelli praised the contribution the two nations offered and offer for European Aquatics. He gave thanks to Czech Fed President Petri Ryskovi and Slovak Fed President Irina Adamkova for their tireless work. Prague (CZE) shall host the junior Europeans in synchro and open water this summer, while Samorin (SVK) the junior worlds in synchro and the federations also staged some major age-group events in recent years. The LEN President also highlighted the greatest efforts of the Czech and Slovak heroes of the past, including the 19 short-course European titles of Martina Moravcova which is still a record in the event’s history or the latest feat of Michal Navratil who claimed silver in high diving at the 2017 World Championships.